The Hall of Fame has files on over 1,100 artists who are Georgia natives or who have lived in Georgia for a significant period. Each year, a select few are chosen for induction into the Hall of Fame. The inductees represent the diversity of Georgia music, including jazz and swing, country and folk, rock and roll, rhythm and blues, classical, urban, gospel and contemporary Christian. Non-performers such as producers and music executives have also been inducted. Gregg began his solo career with the 1973 release of his critically acclaimed album Laid Back, but experienced his biggest solo hit in 1986 with “I’m No Angel.” Today, Gregg continues to tour with the Allman Brothers Band and with Gregg Allman and Friends. Gregg was honored as a songwriter again in 2015. Felice Bryant’s career is decorated with decades of collaborative songwriting with her husband, 1982 GMHF Inductee Boudleaux Bryant. Together the Bryants wrote hits for country music legends like Eddy Arnold and Little Jimmy Dickens and popular hits by the Everly brothers including “Wake up Little Susie” and “Bye, Bye Love.” Felice rarely wrote songs without collaborating with her husband, but she is solely credited with writing “We Could,” a song performed by names like Charlie Pride, Jim Reeves, Kitty Wells, and George Jones and Tammy Wynette. Other notable hits penned by the Bryants include Tennessee’s state song, “Rocky Top,” and Buddy Holly’s “Raining in my Heart.” What a selection for great educational purposes! Columbus, Georgia’s Dallas Austin is a force in both the music and film production industry. He has worked with a variety of big names including Aretha Franklin, Madonna, Boyz II Men, Pink, Usher, Korn and Gwen Stefani. As a producer, Austin has enjoyed 50 hit singles for various artists and TLC’s Grammy-winning album, Fan Mail. His record label, Rowdy Records, released Monica’s debut album Miss Thang in 1995 and the soundtrack to Diary of a Mad Black Woman, among others. In the film world, he served as executive producer/music producer for the urban dramas, Drumline and ATL. The impresario runs a production company, a recording studio, a record label, a merchandising and marketing company, and three publishing companies. Music has been a way of life for singe r/songwriter/producer/mogul Jermaine Dupri since he was an adolescent. At 14 years old, he became the youngest-charting music producer ever. With his So So Def Productions, he developed the career of quadruple-platinum selling teenage rap duo, Kris Kross. Dupri has been instrumental in the careers of TLC, Da Brat, Jagged Edge and Xscape and added his Midas touch to Usher’s Confessions and Mariah Carey’s The Emancipation of Mimi. He has produced, written and recorded 19 songs that have reached #1 on the R&B charts and in September 2006, four singles in the top ten of Billboards R&B/hip-hop chart were produced by Dupri. As president of Virgin Records’ urban division, Dupri’s most recent success story is Atlanta rap group, Dem Franchize Boys. 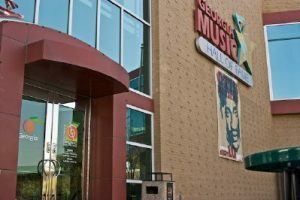 And this way, the story of the Georgia Music Hall of Fame will live on and on. R.E.M.Since forming in Athens, Ga., in 1980, R.E.M. has evolved into one of the most influential rock bands ever. Michael Stipe, Peter Buck, Mike Mills and Bill Berry combined jangly guitars, esoteric lyrics and a D.I.Y. sensibility that would ultimately “mark the point where post-punk turned into alternative rock,” says critic Stephen Thomas Erlewine. From the first album, 1983’s Murmur, to the most recent, 2004’s Around the Sun, R.E.M. has produced music that consistently appeals to critics and its staggeringly loyal worldwide fan base. Singles including “The One I Love” (1987), “Stand” (1989) and the Grammy-winning “Losing My Religion” (1991) brought mainstream success, but not complacency; R.E.M. continues to experiment musically and actively address issues including politics, the environment, and human rights. See also this post on Bill Lowery and Ray Charles. Click here for a full list of inductees of all time.